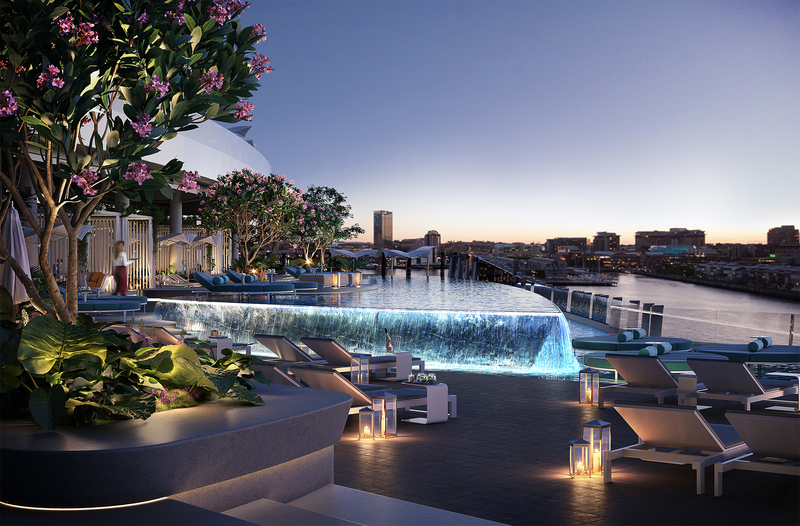 Following 14 months of construction, the hotel and casino development stands almost 120-metres above the harbour, with the first level of the Crown Residences, level 33 scheduled to be poured in July. 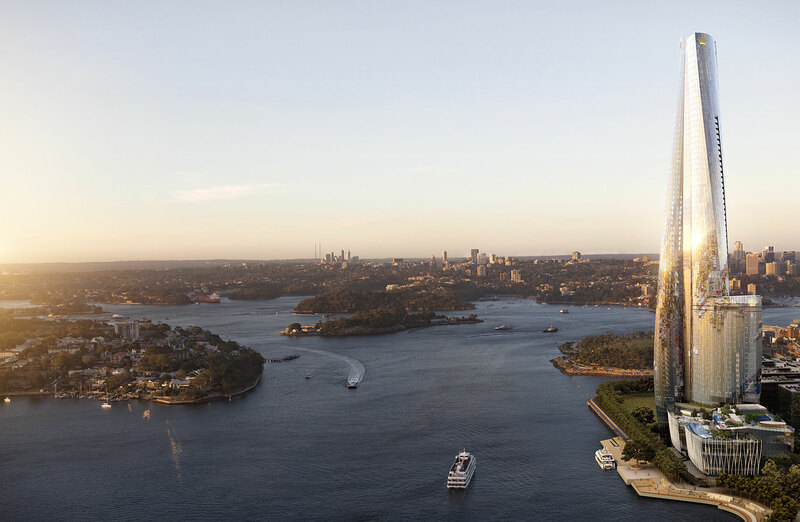 In December, Crown and developer Lendlease won its fight against the New South Wales government to retain Sydney's billion dollar harbour views at the Barangaroo project, in a decision handed down by the Supreme Court. When complete the development will also house a “limited collection” of 82 private residences. Construction of level four residence pool. Right: Level two terrace. The construction team has reached three building stages: completion of the podium structure which is capped off by two roof-top infinity swimming pools, fitting of the first of the hotel rooms, and installation of the glass facade. Crown Resorts’ Todd Nisbet described Crown Sydney as “one of Australia’s most sophisticated buildings” targeting investment from ultra-high-net-worth individuals. “We are singularly focused on delivering a sustainable luxury development that will stand the test of time,” Nisbet said. Up to 78,000 cubic metres of concrete has now been placed, with 14,000 tonnes of reinforcement, and 3,037 tonnes of structural steel in the podium structure placed to date. Image of the level 3 resort pool. Hotel floors start at level six and are now up to level 21. 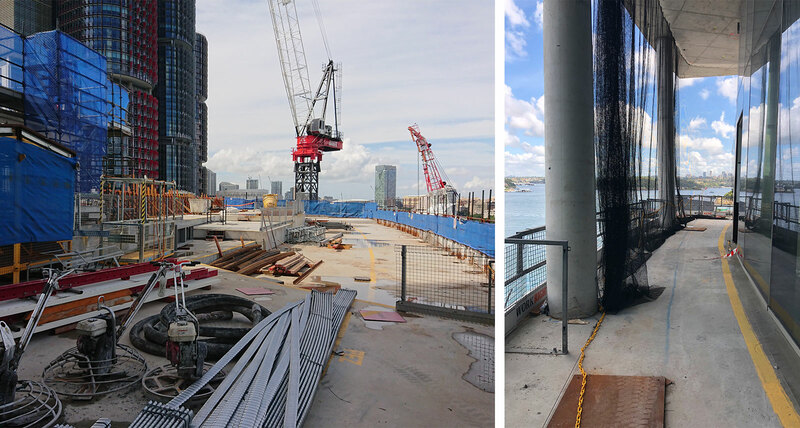 The lift core currently sits at level 29, the current highest point of construction at 120 metres above the water. Exterior glass panel installation has started, totalling over 7000 when complete, and podium exterior glass panels installation is also in progress totalling over 1500 when completed.